​Demonstrations, Exhibits, Educational Displays, a Fluorescent Mineral Display, Silent Auction, and the Nationally-Renowned Rock Food Table Display. 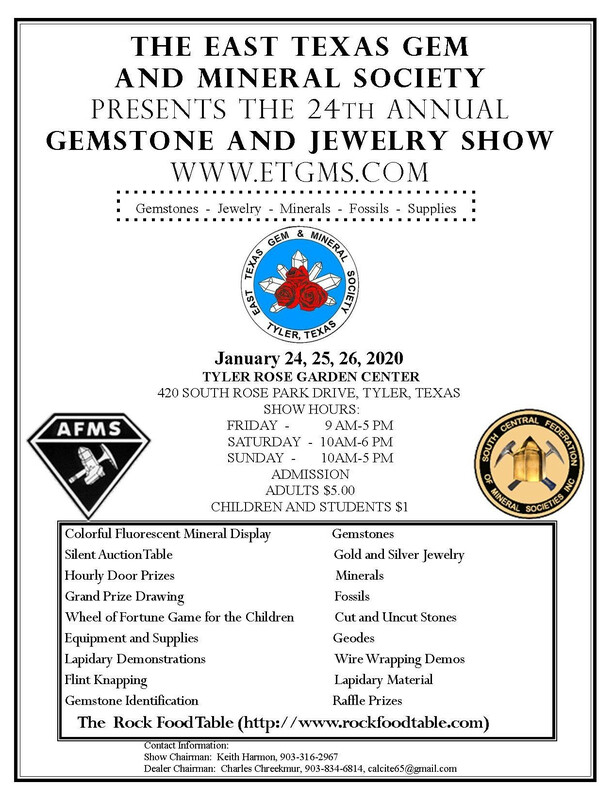 The finest dealers offering everything that concerns the lapidary arts, from Jewelry, Gemstones, Works of Art, Beads, Mineral Specimens, Fossils, tools, supplies, and more! If ​you missed our last show, mark your calendar, because this is unbelievable. The World Renowned Rock Food Table is back at the ETGMS Annual Rock Show! Back in 2015, it started to look like this great collection wasn't going to make it to the Show, since Bill and Lois Pattillo had retired. Our Show Chairman, Keith Harmon, is very active in promoting and educating the public in minerals, fossils, and the lapidary arts. Keith knew how important this display is to the ETGMS show and the people of Tyler, so he purchased it, and donated it to ETGMS. He said, "That way I ensured this unique collection remained together, and will always be a special attraction at the ETGMS annual show. Be sure to come see it! Here's just a sample from our show, there is so much more to see.